This is Tom Kidd's book on fantasy art. It's 192 pages, hardcover. The art is fantastic. It's an instructional book that covers the tips and techniques on painting. The useful tips come from his personal observations. He talks about colours, composition, mood and other topics relating to fantasy art. The techniques are taught by 13 step-by-step demonstrations. They are oil-based tutorials so if you're using watercolours, you need a shift in mindset. For example when painting a snow scene, he lays a base tone over the canvas, which is something you can't do with watercolour if you want to preserve the white, at least in the same sequence as described. What's lacking is perhaps the part on conceptualization. He doesn't talk much about how he gets his ideas, but more on what he does with them. There's one example where he has a flying elephant idea and he eventually turned it into a flying airship with an elephant head. He has a huge reference library and reading material so that's where some ideas might come from. This book itself is also reference for inspiration. 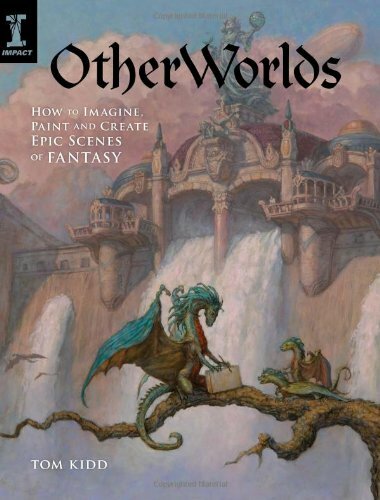 It's a good book for those who already know some basics in oil painting and want to learn more techniques in applying them to fantasy art.